The first part of Top 20 CS:GO Esports players of 2018 included valde, ropz, rain and autimatic. If you didn’t read part1, we recommend you to do so before reading this one. This is part 2 of the Top 20 CS:GO Esports players of 2018 covering players from #16 to #11 on HLTV’s list. SuNny has been part of the Counter-Strike pro world since 2012 when he played at two Areena Minors. He started playing regularly in 2013 for ENCE and won two Minors with them from 2013 to 2014. In 2015, sunNy changed several teams, but most of that time was part of Team ROCCAT. TheFinnish player spent most of 2015 playing Minors and Qualifiers as well as some non Major tournaments. 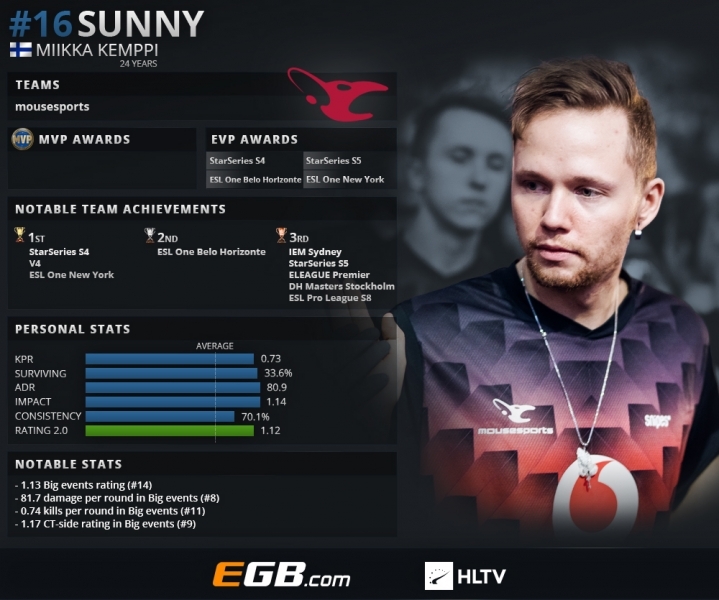 SuNny rejoined ENCE in 2016 and played almost every week that year. He didn’t have so much spare time or rest time. However, considering the number of tournaments played by ENCE, it wasn’t such a successful year for the Finnish squad. They won two Majors and three Minors but also had countless failures at Qualifiers and didn’t even take part in any Premier that year. In the first half of 2017, sunNy played for PENTA Sports which was a step back in his career. SuNny helped PENTA win two Minors and one Major, and his good showings drew the attention of mousesports. SuNny has been playing for mouse to this day and has accomplished numerous achievements with them. They won three Premiers and one Major in last year and a half, and suNny was a crucial player for that success. A rough 2019 start, for the European team, as they will not take part in IEM Katowice 2019. Although team achievements matters, individual performance is something that distinguishes Top 20 CS:GO Esports players of 2018 from the rest of the CS:GO competition. Given that, SuNny is playing on entry fragger position, he is known for his aggressiveness and high damage dealt. He dealt 81.7 damage per round (8th best in 2018) and had 0.74 kills per round (11th best in 2018). Also, he is 14th highest-rated player in Big tournaments in 2018 with 1.13 rating. The Finnish player is very consistent through tournaments, but not very consistent from match to match and round to round. Plus, he plays very well in Group stages of events, but when it came to Play-off, his displays lack consistency. However, he absolutely deserves to be on Top 20 CS:GO of 2018 list considering his great performance at Star Series and ESL One events, as well as at EPL S7 Finals. EliGE is a young player, 21, who started playing CS:GO professionally at the end of 2014 for Team JusTus. Then he moved to SapphireKelownaDotCom. 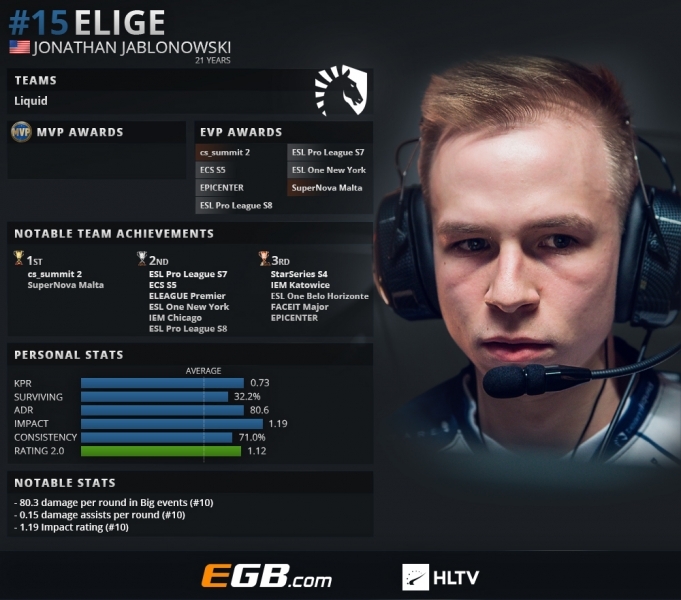 EliGE began 2015 as part of ELevate and in March became a member of his current team, Team Liquid. Jonathan didn’t need much time to get to a Top Tier team. Team Liquid has nothing to regret, given that EliGE contributed so much to the NA team last year. Thanks to inter alia, EliGE’s great displays has helped Team Liquid accomplish great displays over the past several years. Team Liquid actually still didn’t succeed in winning Premier, but they recorded great results and won six other tournaments. Also, Team Liquid surely was the best NA team in 2018, even though some other teams won Premiers, they weren’t consistent as Team Liquid. Big credit for that goes to EliGE. EliGE is another very aggressive player, more aggressive than suNny. It’s nothing unusual considering they play the same position on their teams. However, EliGE dealt a bit less damage per round than suNny (80.3) which puts him in 10th place in that category. He is also ranked 10th for impact rating (1.19) and damage assist per round (0.15). His great individual performances have been rewarded by seven EVP awards. That tells us a lot about how good of a player EliGE is. He sometimes under performs in Play-offs compared to Group Stage, and that may be the reason behind Team Liquid’s lack of trophies. Nonetheless, the American player has never performed below his team’s average, and that’s one of the fundamental reasons for him being the 15th best player of 2018. Another mousesports’ player, tomas is 27 years old. When talking about Top 20 CS:GO Esports players of 2018, oskar needs to be on the list. Oskar has great experience playing Counter-Strike on the pro level. He started competing back in 2006. The most successful part of his career started in 2015 when he joined HellRaisers. To that point, oskar had changed many different teams and spent a significant amount of time in 3DMAX and NEophyte. During his episode with HellRaisers, the Ukraine team won three Majors. 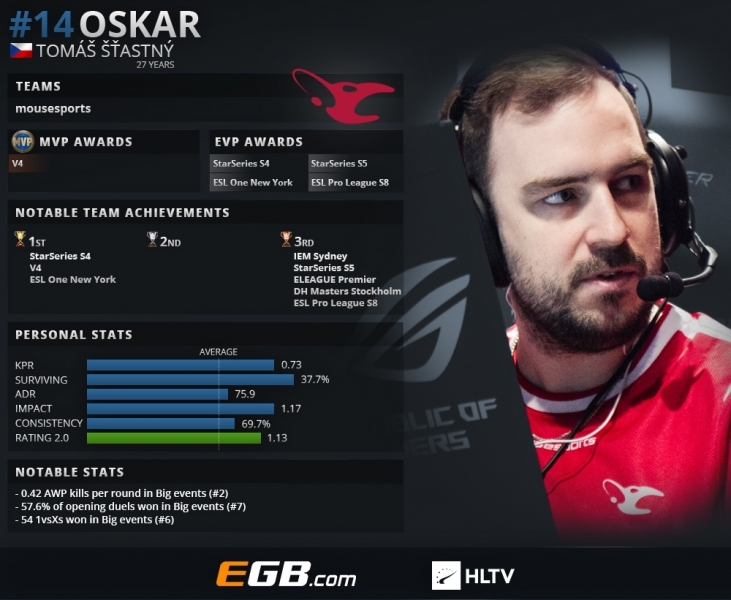 At the end of 2016, oskar joined his current team mousesports. The European team didn’t accomplish anything notable until suNny joined them. Unlike most of the previous players on this list, oskar is included because of his consistency. First of all, he had really good peaks at some particular events. He won the MVP award for his display at V4 Future Sports Festival, where he had overall performance rated at 1.24. However, that wasn’t his best showing at tournaments, considering he earned a 1.25 rating at StarSeries & i-League CS:GO Season 6, but unfortunately, his team blundered. Oskar got four EVPs for his performance at StarSeries and ESL events. In addition, oskar possesses excellent AWP skills. His balance of 0.42 AWP kills per round places him in second spot for the category, and his 1610 AWP kills puts him in the same position when it comes to AWP kills. Oskar proved he known how to open and how to close rounds as he has 57.16% of opening duels won (seventh best) and 54 1vsX triumphs in Big events (sixth best). His inconsistency and low KAST (69.7%) stops him from being higher on this list, but he surely belongs to Top 20 CS:GO Esports players of 2018. Finally, an Astrali player in the Top 20 CS:GO Esports players of 2018 list. It would be a shame not to include an Astrali player. At the end of the day, they were a dominant team last year, and they had no weak points. Therefore, Xyp9x has been chosen to be the 13th best player of 2018. This is not his first time being part of a Top 20 squad. Previously, Xyp9x had been chosen twice as one of the Top 20 CS:GO Esports players of the year. Even though Andreas is a relatively young man, 23, he is very experienced and started competing when iconic CS 1.6 was the main game. Xyp9x is also one of the highest-paid CS:GO players. Xyp9x got his start in 2012 and managed to win a couple of Minors that year. He quickly reached one of the best CS:GO teams, Fnatic. Nevertheless, he didn’t stay there for a long time, considering he moved to Copenhagen Wolves in the middle of 2013. He clinched three trophies there and continued a career in Dignitas in 2014. 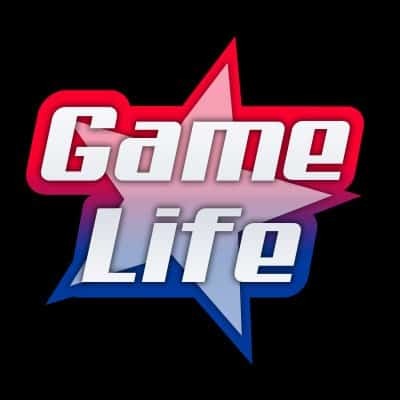 During the time he spent in Dignitas, American team won Fragbite Masters Season 2 and two Minors. Next year, Xyp9x was playing for Team SoloMid. It was a fruitful year for TSM, given that they won nine titles. Andreas then moved to a new team called; Astralis and the rest is history. Astralis won 14 big trophies from 2016 to 2018, and Xyp9x was one of the main reasons. Unlike some of the previous players, Xyp9x is not so aggressive and doesn’t like to be in the heart of the battle. Therefore, he hasn’t had the biggest impact in his teams wins. 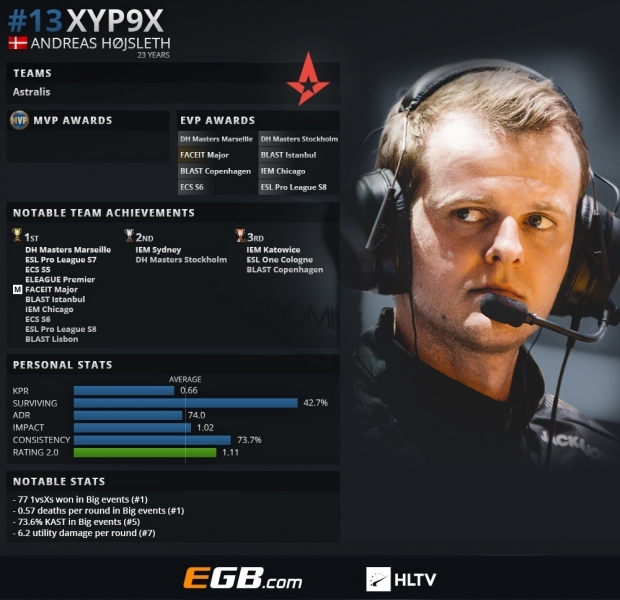 But, Xyp9x has many other characteristics which put him in 13th place on the list. Two stat facts make him an outstanding player. Xyp9x is one of the hardest players to kill, being the best in the category. Opponents manage to eliminate him only 0.57 times per round. Also, Xyp9x is the best clutcher considering he won 77 of his 1vsX duels. Andreas is one of the most consistent players as well, both on round-to-round and tournament-to-tournament basis. He is the fifth player when it comes to KAST with 73.6% score. Plus, he knows very well how to use bombs, given that he dealt 6.2 utility damage per round (7th in the category). The biggest proof for his qualities is his 8 EVP awards. 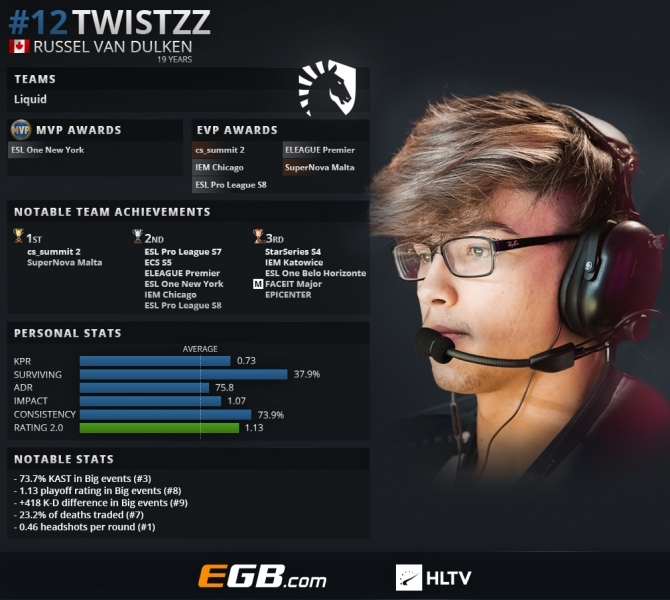 Another Team Liquid player, Twistzz , 19, had a great year with NA team. Considering his age and Team Liquid’s results, there is not so much history on him. He only started playing CS:GO in 2015 Tectonic. Most of 2016, Twistzz spent playing for Team SoloMid. In 2017, he joined Misfits Gaming, and after a couple of tournaments moved to his current team, Team Liquid. Twistzz helped Team Liquid become the best North American team in 2018. There are many words you can use to describe this fantastic player: he has everything in his play, and that’s why people consider him to be an all-around great player. However, one of the things he does best is his headshot accuracy. Twistzz had 0.46 headshots per round (the best in the category). Also, 23.2% of his deaths are traded (7th best), which tells us a lot about his ability to position in the game. Unlike previous Top 20 CS:GO Esports players of 2018, Twistzz performs equally well in both Group Stage and Play-off. Furthermore, he has the eight best rating in Play-offs in Big events. The young Canadian has a huge impact on his team’s wins. He is third in KAST category (73.7%) and has the ninth-best kills/deaths difference (+418). Plus, Twistzz can be proud of the MVP award he earned at ESL One New York and five EVP awards at other tournaments. After all these stats, it seems to be weird that Twistzz is not higher placed on this list. Nevertheless, there are few reasons for this. First of all, his team didn’t manage to win any Premier titles which is quite disappointing. Then, Twistzz himself under performed at a couple events, and that’s why he couldn’t climb higher on the list of Top 20 CS:GO Esports players of 2018. GuardiaN is one of the legends of this Esport, with a long career and absolutely deserves his spot among Top 20 CS:GO Esports players of 2018. He began playing in 2008, but started playing more frequently in 2009 when he was part of Reason Gaming. That year was quite successful for Reason Gaming as they won four titles. From 2010 to 2012, GuardiaN played in only four tournaments. He spent most of his time in 2013 playing for 3DMAX and Virtus.pro. After a not so successful part of his career, he joined Natus Vincere in 2014. Guardian was a member of Ukrainian team until the middle of 2017 when he joined his current team. NaVi won six Premiers and three Majors during GuardiaN’s stay. They also took many other “Silver medals” at other events. GuardiaN’s adventure in FaZe kicked-off in great style. 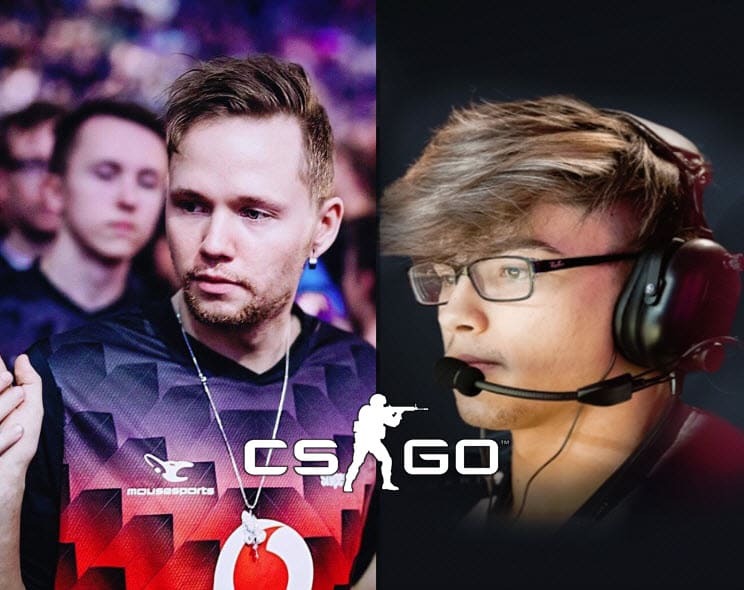 After best AWPer of 2018 joined FaZe, the European team won two Premier titles and $625.000. GuardiaN also helped them win the ECS Season 4 Finals at the end of the season. Last year was successful for FaZe, given that they won three Premiers and a large amount of money. We can easily say GuardiaN was the best AWPer of 2018 with his ratings and statistics proving iy. The Slovakian player has the most AWP kills per round (0.44) and generally, most AWP kills in 2018 (1779). 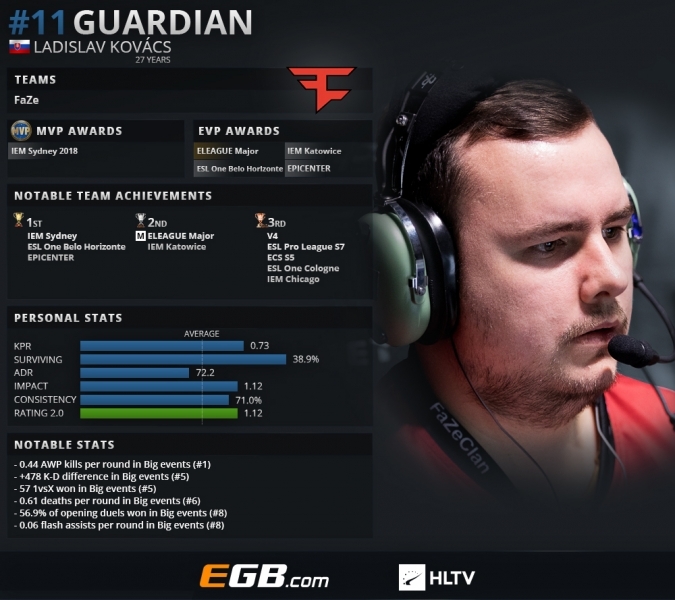 GuardiaN was in the top 4 players that were competing for MVP awards three times. He won the MVP award for his display at IEM Sydney when FaZe beat Astralis in the finals. The other two times, he finished as a runner-up. Besides his MVP award, he has claimed four EVP awards. GuardiaN knows more than just “AWPing” opponents. He is the sixth-best survivor (0.61 deaths per round) and has the fifth best K-D difference (+478). In addition to that, GuardiaN knows very well how to step up in rounds (56.9% opening duels won) and how to close a round (57 1vsX duels won). Some inconsistencies costs GuardiaN a higher place on the list of Top 20 CS:GO Esports players of 2018.